This article first appeared on the FQXi community website. FQXi are our partners in our Information about information project, within which we explored quantum computing. Click here to find out more about quantum computing. It's easy to understand why physicists can't let go of this particular love affair. Quantum computers present such enchanting temptations: The ability to sift through mountains of information billions of times faster than any classical computer. The offer to break the most stringent security protocols today and innovate better ones. And the capacity to simulate the interactions of complex quantum systems in precise detail to gain deeper insights into the workings of nature. It's now more than thirty years since the infatuation with quantum computers first took hold, when Nobel Laureate physicist Richard Feynman realised that these hypothetical machines could potentially boost our technological capabilities beyond our wildest imaginations. Move into the real world, however, and the situation is very different from what was once promised. The challenge is working out how to translate the fairytale into reality: how to store and manipulate bits of quantum information, or qubits, on a large enough scale that they create a working quantum computer. 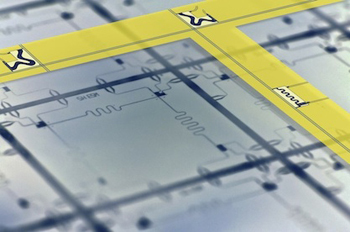 In 2013, physicists at the ETH Zurich, in Switzerland, successfully teleported information 6 millimeters across a superconducting chip. Credit: Stefan Filipp, ETH Zurich. "Qubits have personalities," says Lieven Vandersypen at the Kavli Institute of Nanoscience, TU Delft, Netherlands, describing the difficulties encountered when trying to handle such systems. "Every qubit we build behaves a bit differently and a significant engineering as well as materials effort is needed to improve reliability and reproducibility." On paper, the theory behind quantum computing has now been widely fleshed out. Today's computers are constrained to operate according to classical rules — representing information as a string of simple ones and zeros. By contrast, every quantum system can exist as a multiplicity of states simultaneously. Thus, at the most basic level, each qubit can be one, zero or any combination between the two. Put two or more qubits together and new interactions begin to emerge that have no counterpart in our everyday world, enhancing our capacity to manipulate and process information by magnitudes. In the 1990s, physicists began developing complex algorithms to harness all this theoretical computational power. The most celebrated examples are an algorithm developed by Peter Shor, which allows numbers to be factored more quickly than any classical computer, and an another by Lov Grover, which describes how to search through a database exponentially faster than a standard machine. Since then, experimental physicists have become increasingly adept at handling quantum systems at ultracold temperatures in the lab. These have been built from, for instance, trapped ions, nano fabricated superconducting circuits, and entangled photons of light — and these seem to be some of the best candidates to use as qubits in large-scale quantum computers. Other exotic options include nitrogen atoms embedded in diamonds and theoretical two-dimensional "quasi-particles," known as anyons. Physicists have also figured out how to link these qubits together, using a quantum phenomenon called entanglement, so that they behave as one when measured. And they can successfully encode information in photon qubits, and transferring them across vast distances. But there, they seem to have stalled. "The question of scalability is experimentally not solved yet for any systems, regarded as potential candidates for quantum computing," says Stefan Filipp, a quantum physicist at ETH Zurich in Switzerland. The major problem, he explains, has been making quantum systems robust to outside disturbances. Larger systems have more qubits with more complex interactions, making them far more susceptible to interference from the outside world. Heat and even just physical knocks to the apparatus can cause the qubits to decohere — losing the quantum properties that lie that the heart of their processing power. "Scaling up beyond 10 qubits while maintaining a high degree of quantum coherence is the bottleneck for quantum computing," says Vlatko Vedral, an expert on quantum information at the University of Oxford, UK. It is not clear yet whether these technical challenges can ever be tackled. Scientists have never probed quantum mechanics at this size and complexity. However, there is no experimental evidence currently of a basic physical constraint limiting the coherence of large quantum systems. "Although models speculating about unavoidable decoherence mechanisms intrinsic to nature exist, those might not hinder the realisation of a quantum computer as long as the effects are small," Filipp says. Vandersypen, a pioneer in this arena, is acutely aware of the technical hurdles. As part of his PhD in 2001, he constructed a seven qubit computer by manipulating nuclear spins (internal quantum properties of atomic nuclei) with strong magnetic fields and used Shor's algorithm to factor the number 15. It was one of the earliest physical demonstrations of quantum computing and excited many, particularly as such qubits can be made at room temperature. However, the thermal noise at room temperatures has made it impossible to scale the number of qubits up significantly. Optical mask for fabricating superconducting chip devices Credit: Stefan Filipp, ETH Zurich. Overcoming decoherence is hugely important because qubits must preserve their quantum properties for the durations of calculations, and so physicists have been searching for different materials and building blocks that exhibit far less decoherence. In 2013, researchers in Canada, Germany and the UK maintained a quantum state for a record-breaking 39 minutes in silicon, doped with phosphorous. The quantum information was encoded in the nuclei of the phosphorus atoms. Another popular area of research is superconducting circuits, where the very low temperatures allow quantum effects to dominate and electric currents to flow without resistance, creating macroscopic objects that are fractions of a millimeter in size but fundamentally quantum in their behavior. The qubits created here are remarkably long-lasting, surviving for several microseconds — an eternity in the quantum computing universe — and capable of being manipulated to construct quantum logic gates and circuits, the underpinning of a working quantum processor. One of the most promising avenues is trapped ultracold atomic ions, where information is encoded within their energy levels and manipulated using bursts of laser light. "Trapped ions are probably the most advanced system in this field," says Jonathan Home, a quantum physicist at ETH Zurich, Switzerland. "We can do everything on a single atomic ion at the accuracy level required for large-scale quantum computation, with errors of less than 1 part in 10,000." Home achieved a notable breakthrough in 2009 when he and his team at the US National Institute of Standards and Technology in Boulder, Colorado, demonstrated the first small-scale device to perform all the core steps needed in large-scale quantum processing. Using ultraviolet laser pulses and electric fields to manipulate two trapped beryllium atoms, the scientists initialised and stored qubit data in the ions; performed simple logic operations on the qubits; transferred the information between different locations; and then read out the resulting data, with the whole process being repeated thousands of times. Their prototype quantum processor worked with an overall accuracy of 94%. Though exciting, in order to scale up to a large system, any realistic quantum computer will need to be even more accurate — and will need to tie together many more individual quantum systems. "For conditional logic — operations between different atomic ions — the fidelity needs to improve by more than an order of magnitude," says Home. "We think we understand what we need to fix, so it is now an engineering and error-diagnostic challenge to improve things." And the 64,000 qubit question — how far are we from a fully working quantum computer? The different pieces of the puzzle are slowly coming together. 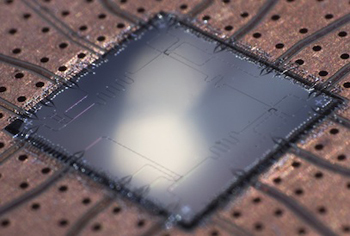 Trapped ion scientists can now prepare coherent states of more than ten qubits. Meanwhile, superconducting qubits can perform gate operations in less than 10 nanoseconds. The progress in different fields has led some to wonder whether the future lies in hybrid devices that combine these different physical systems to exploit their advantages, for example, the long coherence times of atoms coupled with the fast control of superconducting qubits. "This can be useful to separate, for example, the long-lived quantum memory part of a quantum computer from the fast quantum processor," explains Filipp. All agree that the road ahead is a long one. But people should be patient, and not fall out of love, just yet. After all, says Vandersypen: "Everything we do, nobody has ever done before. This means we have to find out the best way to do things, and this takes time."